Wind chimes Length: 21 inches. Wind chimes width: 5.1 inches. Crystal Ball diameter: 2.5 inches. 1.Make sure the switch is set to "ON" positive. 2.Keep the solar panel clean and install the solar product in an area where it can get direct sunlight. 3.Solar Powered Wind chime will work automatically, It will automatically charge under direct sunlight during the day time and illuminate at night. 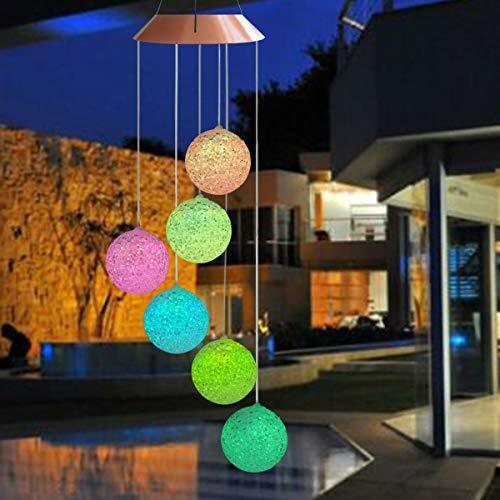 ❤【7 COLOR-CHANGING】Hanging chimes with solar-powered color changing LED glow stars.7 color changing LED bulb illuminating the crystals at night, calmly and softly changing from one color to the next. ❤【SOLAR ENERGY】Energy saving and environment friendly, Keep switch in'ON' position when get direct sunshine. Charge during the day time and glow in night. LED lights work last up to 100,000 hours. ❤【LIGHT SENSOR】Lights light up automatically at night, featuring color changing LED bulbs, and change colors in random. ❤【INDOOR OUTDOOR DECOR】 Hook to easily hang from trees, fences, patio, garden, lawn, other features. Great gift for Christmas, Birthday, Holiday, Thanksgiving, Halloween, Mother's Day, Father's Day. ❤【WARRANTY】We provide 30-days No Question Asked money-back and 12-months warranty. Please feel free to contact us if you have any question. If you have any questions about this product by Topspeeder, contact us by completing and submitting the form below. If you are looking for a specif part number, please include it with your message.